Stock photography isn’t what it used to be. Gone are the cheesy cutouts and posed images. Those who purchase stock photography now want authentic, real-life images for their advertising – at least to make it look like they are authentic, real-life companies, selling authentic, real-life products. I delved into the world of stock photography a couple of years ago, even purchasing a fancy Nikon d750 to help reduce the grain in my images so there would be more chance they would be accepted by the stock agencies. I knew from research I wouldn’t make a ton of money submitting my images to agencies that then sell them to advertisers, bloggers, or other content managers, but I hoped to make a little extra to add to our household needs. Building up a portfolio for stock photography can take a very long time. I knew this, but this past year I’ve been more than a little discouraged with the industry and have learned stock may be a way to earn a small side income, but not necessarily a career. Unless you already have the cash to travel the world or are single with no children, stock photography is an extremely difficult “job” to make money at. Still, I plug away at it, submitting photos here and there because it’s not like they’re going to make any money sitting on my hard drive or even hanging on my walls. And even if the money isn’t a lot, it’s something and every little bit counts in this day and age. Last year I was featured on Alamy.com as a featured artist and hoped that would boost my sales. It didn’t, but the honor was a nice one to have, at least. If you are a photographer who is considering stock photography, some advice I would give is to not expect to make a great deal of money, even if you are accepted by a “high end” stock agency like I was. At least not at first. When I first signed up with one high-end agency, I was promised a starting price of $150 for each image sold, if not higher, but once I was accepted and began submitting images, that amount suddenly decreased until one of my last sales with them was 83 cents for one image. On the other end of the spectrum I also sold one for $120, so, in other words, I’ve discovered the amount you could make with stock varies greatly. With many agencies you need at least 500 images to start making sales and usually having more than 1,000 is even better. Most agencies allow you to submit whatever images you want but then they must pass “quality control” to be added to your final portfolio. The standards of some agencies are higher than others. For example, Alamy allows almost anything to be submitted as long as it isn’t graphic, nudes, out of focus, or severely grainy. Their collection is aimed at anyone and everyone, much like Shutterstock, which I believe is based in the US. For an agency like Cavan Images, your images will be accepted only if they fit their particular style, which is more artsy-fartsy, as I call it. They say their agency is for more high end clients but, again, this is the agency that once sold one of my photos for 83 cents and another for 67 cents so …. don’t always take an agency at their word. To pass quality control for most agencies the images don’t have to be artistically amazing, but they should be bright and without grain or blur. Each stock agency has their own rules about what the photos need to pass quality control and you can usually find that listed on the site before you submit. As for what sells in stock photography: the answer is almost anything, yet sometimes nothing. With some agencies, you can upload whatever you want because you never know what will sell. I’ve seen portfolios with photos of newspapers and trash cans and hands holding cellphones and for some reason those photos sell, mainly because some client, somewhere, needed the shot for some purpose. Some of the photos that have sold for me are not my favorites or technically perfect. Still, they brought me more income than they would have sitting in a hard drive, so I won’t complain. Right now the thrust of stock photography is “authentic imagery”, which can mean different things for different clients but normally means everyday people doing every day things. The bottom line is that stock photography is not, for most people, a way to get rich fast, but if you keep plugging away and submitting images, you can at least earn a bit of a side income. It’s been downloaded 64 times so far and you might think that means I made a lot of money from it’s sale, but sadly the total is about $240 in five years. 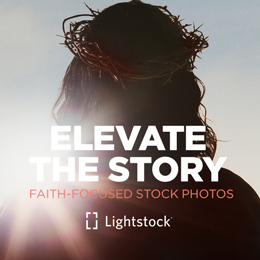 Lightstock is not one of the agencies that compensates photographers at a high rate, but I support them for their message, more than their revenue capabilities. To see more of my photography you can visit my photography site here or see my work on my Instagram account.